Want to explore Electronics, Micro controllers or Programming to improve your projects? Want to learn about some of the projects that can be completed by the Maker in you? Check out this introductory session to get you thinking, then sign up for the upcoming workshops. On Tuesday, Nov 8 we’ll start with an open session to discuss some of the basics of the vast topic of electronics, computers and programming. We’ll start at the beginning and move through electricity, electronics, computers and programming. Motors, lights, transistors, computers and programming all have their place in many projects, and we’ll touch on how you might use them in yours. With a combination of working samples, models and visual aids we’ll look at the ways you can get involved with this fascinating and ever-expanding area of technology. Drop in for How-To Mondays, our new Open House night! We'll be showing you all kinds of simple fixes and skills, and while you're learning something new, you'll also have the opportunity to take a look around, talk to a member, learn more about our organization, or even become a maker! 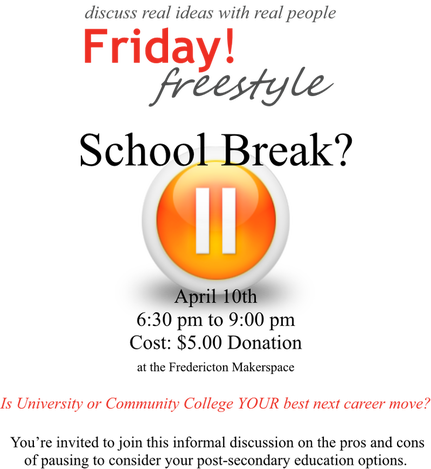 Check out the Home page to see this week's topic. Learn how to make your own screen plus your own screen printing. Awesome workshop, great for your creative side! Love taking photos with black and white film, but don't love shipping it away to be processed? Learn how to do it yourself! Join the Fredericton Makerspace for a workshop with local analog filmmaker and photographer Kelly M. Hill and learn how to process your own black and white film with both traditional and experimental methods. Bring your own roll of undeveloped 35mm or 120 film to process, or practice with one of our sample rolls. ​Click here to reserve your spot. Learn the basics of woodworking, how to use tools and get guided help to finish your own woodworking project. Maker Talks is a fundraising event in support of the Fredericton Makerspace. All proceeds raised will help kick off a campaign to purchase much needed tools and equipment. Come listen to local makers talk about their talents and skills. Doors open at 7:00, and if you're new to the Makerspace, a member can give you a tour and answer any questions. We'll also have a cash bar and snacks on hand. Early bird special - Free glass of Picaroon's beer included in ticket price. ​The Fredericton Makerspace, in partnership with Brilliant Labs, will be hosting a session outlining the basic principles of Rapid Prototyping and showing some equipment that is used in this process including 3D printers, Vinyl Cutting and CNC routing. An expert in the field will be discussing some of their experiences in industry pertaining to Rapid Prototyping from conception to fabrication. Other experts will be available to chat about their experiences and share their advice. We'll reschedule for after March Break. This workshop will provide a basic introduction to 3D with a focus on polygon modeling in Blender. In addition, an overview of how 3D is used in a variety of fields and the differences in the many 3D applications available will be provided. We will look at being able to navigate and work within 3D space. This would involve examining Blender's user interface, the types of tools available, and how to use them. Kyle Brewer completed school for 3D animation in 2006. He's been working as a 3D modeler/artist, and has been a 3D instructor for the past four years. He bought his first 3D printer about a year and a half ago so he could begin printing his own designs. It would be best for everyone to have a laptop with a 3 button mouse. Look forward to more workshops that make use of the skills you'll learn here! Participants will learn basics of working with the two main types of graphics: bitmap/pixel images using Photoshop, and vector/line art using Illustrator, and how the two programs can work together to provide a complete graphics workflow solution. 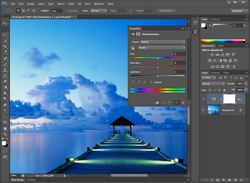 Photoshop topics will include interface overview, file handling and colour modes, working with layers, working with type, modifying colour/saturation levels, basic retouching tools and special effects filters. Illustrator topics will include interface overview, vector drawing basics via Bezier curve manipulation, basic drawing and warping techniques, using autotrace to work with imported bitmap images, working with blends and meshes, and importing and exporting graphic assets. Troy Moore is Lead Instructor in the daVinci College Graphic Design and Web Development program and has been using Adobe products professionally for over 20 years as a designer/art director. Participants need to bring their own PC with software pre-loaded. Free trial versions are available at www.adobe.com/ca/creativecloud/catalog/desktop.html. If you really want to come, but don't have your own laptop or software, we may be able to help. Message us first to be sure. A selection of project files will be made available free of charge, or you can bring your own images/photos, or you can download assets from Google etc. to work with throughout the workshop. Vicki Gustafson has been a quilter for many, many years and dog coat maker for the last 2+ years. WHAT TO BRING - IMPORTANT! While we do have a couple of sewing machine at the space there aren't enough for a full class. If you have a machine please also bring it. Follow up times can be arranged if you don't quite finish on time. Woodturning is a type of woodworking where wooden objects are created on a lathe. In woodturning, the wood is turning while the tools are stationary. This 2 hour workshop offers a brief introduction to setting up a wood lathe and various woodturning tools (gouges and chisels - provided). Through presentation and hands-on sessions, you'll be introduced to the tools and skills of woodturning and you'll be able to take home your own turned creation. Andrew Steeves is a UNB Mechatronics student with varied interests including dogsledding and woodturning. All materials and safety glasses are provided! Make sure to wear clothes you don't mind being covered in sawdust. Closed toe shoes are a must in the woodshop. This is an introduction to electronics for the person interested in knowing the basics in order to experiment with electronic components or looking to safely connect things to their Arduino, Basic Stamp, Raspberry Pi, etc microcontroller. It provides a good basis for a subsequent, more specialized, microcontroller workshop. Through presentation and hands-on sessions we'll look at diodes, resistors, capacitors, transistors and integrated circuits. Registration includes a kit of parts to use during the workshop and take home for further experimentation. Tom Sisk is an electronic technologist and Professional Engineer with over 40 years of experience in electronic controls, power systems and microcontrollers. All materials are provided! Registration includes a kit of parts to use during the workshop andtake home for further experimentation. The Makerspace Satoshi society is a bitcoin meetup held at the Fredericton Makerspace. It's a place for anyone who would like to learn more about bitcoin technology, or anyone who is already knowledgeable on the subject! Come hang out with the technologists and thinkers in the region who are forging a new technological economy. 7 pm Saturday, January 23rd at the Fredericton Makerspace. 5 dollar donation at the door, all proceeds going to the Makerspace. Come and meet BB-8, one of the stars of Start Wars: The Force Awakens! Built by Cory Pacione with the help of the Fredericton Makerspace! You'll learn a bit about 3D printing, and how the droid works! Cory is the founder of Creative Juices. He's been a Star Wars fans as a child and has been buliding droids for a long time. BB-8 is his latest droid! Science East will also be there with Sumo BOTS! Learn how to design, build and program these dueling bots, and then watch them go head-to-head in our robo-ring to see who comes out champion! 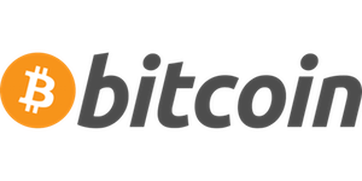 Bitcoin is a form of digital currency, created and held electronically. No one controls it. Bitcoins aren't printed, like dollars or euros. This currency is produced by people running computers all around the world, using software that solves mathematical problems. It's also an open source software project that has changed the way thinkers think about money. Come learn the basics about bitcoin's origins, capabilities and potential. Jason has spent the last three years as a serious student of Bitcoin technology. He has attended two international conferences on the subject and is excited to share his knowledge. No materials required though a laptop or smartphone might come in handy. Capstone Computer Consulting is a local company focused on providing high end custom computers for technical industries such as engineering and architectural firms. In this session, we will be performing a live build of a custom computer for a client at UNB. The computer is designed to communicate with a milling machine to turn 3D models into real physical components. In this demonstration, we will be showing you all the steps, from unboxing the components, to assembly, to the finished product. Everything you need to know to select the components needed to build your very own custom computer. Whether you are a custom computer enthusiast, or simply have an interest in the topic, everyone is welcome to attend. Anyone attending the event will also be eligible for a 5% discount on future computer purchases from Capstone. Owner of Capstone Computer Consulting. Harold has over 7 years experience building custom computers for both personal and industry usage. He holds a diploma in Engineering Design and is entering final year of additional degree in Mechanical Engineering. No materials needed! Just come and check out the build! Event is FREE to attend but donations are welcome! Let's Build a Cat Tower! Buying a cat tower from the pet store can be expensive! Come build your own at the Fredericton Makerspace! We will supply you with ALL OF THE MATERIALS and tools needed to make a cat tower that is roughly 4 feet tall with multiple levels for your cat to enjoy. You'll leave the workshop with a cat tower to take home! This is a great opportunity to get familiar with the woodshop and learn how to use power tools if you have never used them before! This project was proposed by Clint Gardiner after building his own cat tower. Troy Moore is the keeper of our woodshop and has created lots of amazing projects in our space. Nothing to bring! We have everything you need to make the project. Even if you're not familiar with a woodshop, we'll have the support you need to use the tools and have a fun night. Note: picture here is just a illustration. Yours may turn out a little differently! As a continuation to the Beginners 3D Modeling for 3D Printing; we would cover more tools, cutting up your model, fixing errors, measurements, and making your model hollow for SLA-SLS 3D printers. We will be creating a model that is ready to be sent off to a printer as we cover the above mentioned topics. Even if you missed part #1 you can still join us! Kyle completed school for 3D animation in 2006. He's been working as a 3D modeler/artist, and has been a 3D instructor for the past four years. He bought his first 3D printer about a year and a half ago so could begin printing his own designs. It would be best for everyone to have a laptop so they can participate and follow along. We would use free software that we can install. Windows based PC/Laptop with a three button mouse recommended. If you don't have a laptop, select a 'No Personal Laptop' ticket and we'll TRY to accomodate! 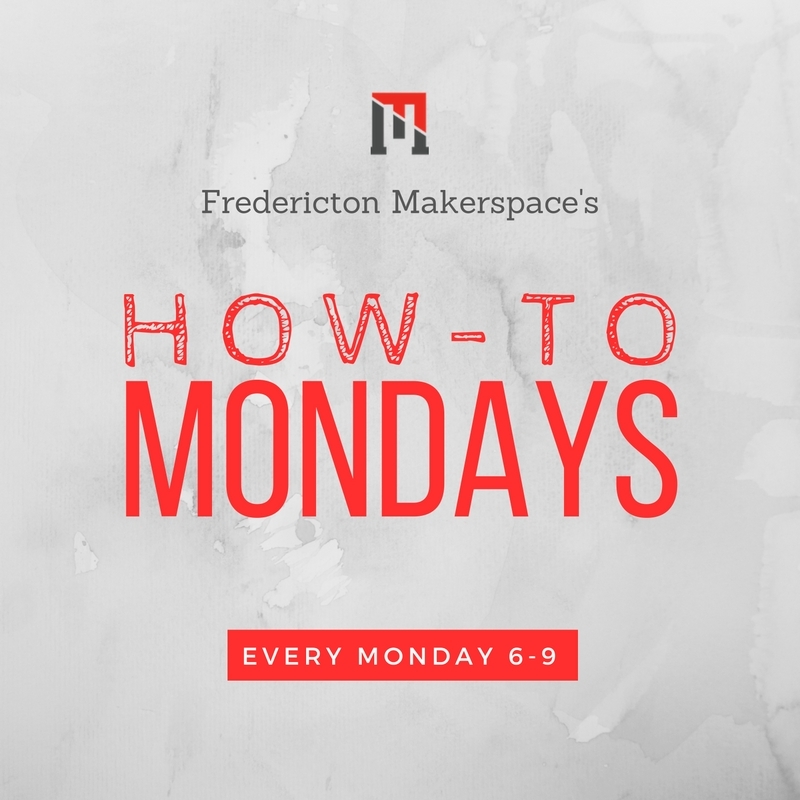 The Fredericton Makerspace is also looking to offer additional classes in the future that may include modeling packages such as Tinkercad, Sketchup, Sculptris, and more. If there are some of these packages that you're interesed in, let us know! A microcontroller is a small computer on a single integrated circuit containing a processor core, memory, and programmable input/output peripherals. Program memory is often included on chip, as well as a typically small amount of RAM. Learn how to get started (or get better) with these multifunctional tools for engineers, scientists and experimenters. ​A brief presentation of the evolution of microcontrollers plus explanations of 8 project demos Tom will have with him. Covers a range of microcontrollers including Arduino, Atmel, Stamp, Cubloc, Z80, Nutchip and their programming environments. Tom has been a electronics technologist (1973) + Electrical Engineer (1982) + 30+ years designing, programming and installing industrial control systems. Notebook (the paper kind!) and pen/pencil. Imagination and questions about using microcontrollers. Rick McCaskill 3-D printed these frames for his glasses. 3-D printers have been in use in the industrial design field since the mid-1980’s. It’s an additive process that works very similar to an inkjet printer. Our MakerBot Replicator works by heating a plastic filament (PLA) that's "printed" in thin layers on a bed that moves down in very small increments after each pass of the print head. Each layer builds upon the previous ones, resulting in a 3 dimensional object when it’s finished. Does it cost anything to drop in? 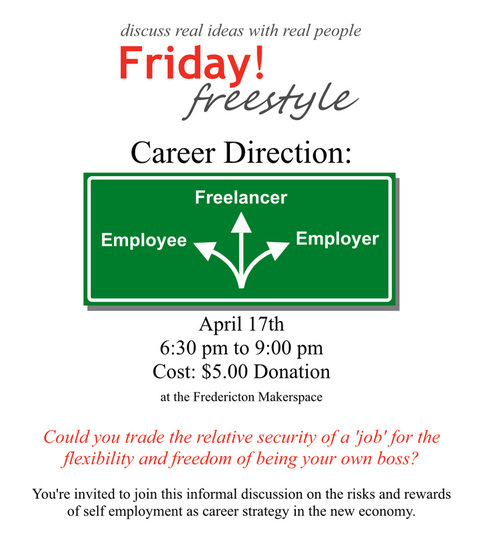 If you are a member of the Fredericton Makerspace this is a free event covered by your membership. For non-members we do ask you to make a small $5.00 donation to the Makerspace to ensure events like this have a home in the future. Workshops that offer more in-depth training in designing and scanning for 3-D printing will be offered soon. If you would like to become a member, we will have members on hand to help you or you can sign up now ! Why not drop by and see what you can create with our 3-D printer. This workshop will provide a basic introduction to modeling in 3D with Blender as well as examine the tools and requirements for 3D printing. We would look at being able to navigate and work within 3D space.This would involve examining the types of basic tools available and how to use them. As a group, we will model using primitive objects to create more complex geometries; checking for errors and how we can fix them so that they can be printed. It would be best for everyone to have a laptop so they can participate and follow along. We use free software that you can install. Join us on MAKER DAY !! The Fredericton Makerspace, The Gaia Project, Brilliant Labs, Science East, Capital City Cycles & The Fredericton Public library are hosting this creative event celebrating organizations and people who show the "Maker Spirit". Fredericton Makerspace - See demonstrations of3-D Printing, Arduino Electronics, screenprinting, passive solar heaters and more. Check out our new 20' x 40' woodworking shop. The Gaia Project - You've likely heard a lot about renewable energy - come experiment in real-time with The Gaia Project's Mobile Energy Centre! This hands-on, travelling lab is equipped with a solar thermal panel, a solar electric panel, a wind turbine, a hydroelectric demonstration and a bicycle generator. Brilliant Labs - Get hands on with robotics, circuitry and electronics, vinyl cutting, sewing, embroidery, and coding. You can also try out the oculus rift, help build a 3D printer, and learn to create your own video game using fruit or anything else which conducts electricity. Science East -Encouraging young people to be creative with their exhibits and camps! Fredericton Public Library - Interesting things going on here, new seed library and a photo/video green screen project. Capital City Cycles - Fixing bikes, supplying organizations with bikes, it's all about bikes!! you learn how get a sewing machine up and running. The regular Singer sewing machine in the space is now operational and ready to use. have your own portable sewing machine and have questions about it, bring it with you as well. 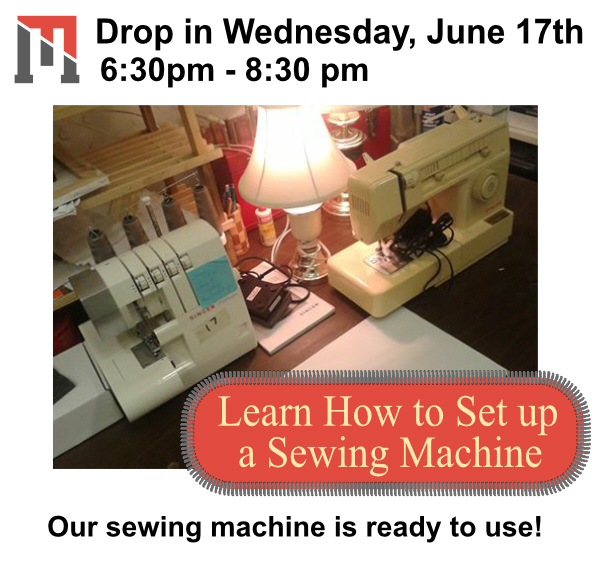 Let us know if you're interested in taking a sewing workshop. /ˈpərməˌkəlCHər/ (n): From PERMAnent agriCULTURE, is a practical system of ecological design. By employing powerful natural patterns, one can design & build profitable & productive edible ecosystems which have the diversity & resilience of natural ecosystems. This three-part introductory course offers a brief overview of Permaculture Design and a few backyard and urban applications. The course will take place over the first three Thursdays in June - from 1:30 pm until 5 pm each day. Each class will focus on different aspects of Permaculture Design. Participants will learn the basics of permaculture and ecology, and how to design any living system by these principles, including how to apply them to our own community. The final class will involve the creation of a Permaculture Design map of participants' actual backyards using images from popular mapping websites, as well as a list of DIY projects to help you make it happen. For more information, email ftonfreeskool@gmail.com or call (506) 238-0411. Registration is necessary BEFORE the event begins - if more than 10 register, there will be a repeat of the event immediately following the first series (also in June). Upon completion of this course, participants will be awarded a certificate that qualifies them for discounts and perks on various programs offered through the Makerspace and our partner organizations (such as Capital City Cycles, Falls Brook Centre, and Marysville Place). Registration is $90 per person ($30x3), or $70 per person for students or (corp/org) groups of 4 or more. Learn to decorate cookies with royal icing and impress your family and friends with your beautiful creations! No experience needed. It's easier than you think! This workshop is also suitable for teens. Join us on Wednesday, May 13 from 6:30-8:30 p.m. at the Fredericton Makerspace for step-by-step instructions for making beautiful cookies, including lots of helpful demonstrations, tips, recipes and laughs. All supplies provided and you even get to take your chef-d'oeuvres home at the end of the session. Bring an apron if you want; it can get a little messy sometimes! Contact info@frederictonmakerspace.ca for more information. Limited spaces available - sign up today! This event will now be hosted at 469 King Street! (not the Makerspace). Even though this is a Fredericton Makerspace event, it's being hosted in the Wear Your Label Design Studio (2nd Floor) on King Street. Thanks to our friends at Wear Your Label for the use of their space! Silkscreen printing is a versatile printing method that gives you the ability to print designs on mediums such as paper, textiles and many other surfaces. Have you ever wanted to make your own custom t-shirt, tote bag, sticker, poster, or greeting card? In this workshop you will learn the basics of the screen printing process, from image creation to screen preparation and printing techniques. By the end of the session you will gain some experience printing on multiple surfaces such as paper and textiles. Students will learn all they need to start screen printing. After an informational overview of the entire process, students will dive right in to hands-on work so that by the end of the workshop they leave with some printed products as well as the skills to print on their own. Students can bring their own materials to print on - t-shirt, tote bag, paper, etc. 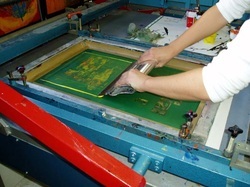 The instructor will provide materials for test prints and screens and ink. Students can also bring their own ink to experiment with. You're invited to drop by the space tonight to see what we're doing, talk about how a makerspace community works and what you want to Make & Learn. 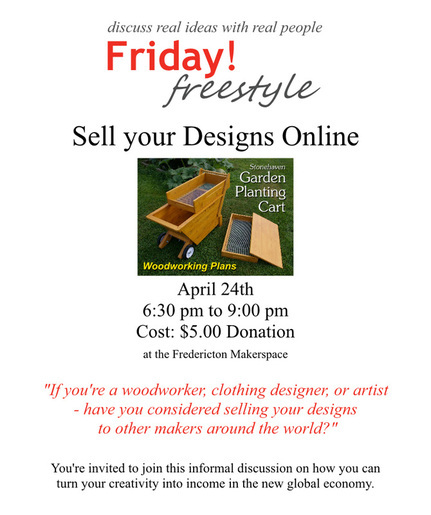 "If you're a woodworker, clothing designer, or artist - have you considered selling your designs to other makers around the world?" You're invited to join this informal discussion on how you can turn your creativie ideas into long-term residual income in the new global economy. Friday! freestyle host and maker, Rick Atkinson has been a self-employed creative freelancer for over 27 years. As a proponent of life-long learning, his insatiable curiosity has garnered him diverse experience from retail management to video production to CAD/CNC cabinet design. He has no plans to retire because he loves what he does - learning by doing. Come learn all about soap, a brief history, science and how to make cold process soap and laundry soap. As a participant you will make your own custom soap and laundry soap using natural additives for colour, skin conditioning and aroma of your choice. All supplies and materials are provided. You get to make and take home your very own batch of soap (14 bars of soap), reusable soap mold and a custom recipe created by you. As well, we will be learning how to make our own natural laundry soap, which you will also get to take home and try. Making your own natural soap is great hobby and makes for wonderful custom gifts that can also be helpful in treating skin conditions. This is a workshop for ages 12 and up. (Teens must be accompanied by an adult) as we will be working with caustic chemicals. Space is limited! Advanced registration required $80. *For safety and hygiene reasons you are required to bring your own safety goggles. You may also wish to bring rubber/latex gloves. NOTE: Tonight's Beading Class has been postponed to a future date to be determined. Don't be fooled by the name, this class isn't just for beginners - even seasoned jewellery makers will learn a thing or two!! This class is great for tips and tricks on making quality jewellery that you'll be proud to say you made! You will be making a necklace, a bracelet and a pair of earrings (all supplies included in the lesson fee) over the 3 hour lesson. Tools to be provided for the lesson. Please note: This lesson is a pre-requisite to most of the intermediate beading/jewellery making classes! "Could you trade the relative security of a 'job' for the flexibility and freedom of being your own boss?" of self employment as career strategy in the new economy. This Tuesday we'll be discussing Sterling engines and what we need to have in place to support this as an ongoing project. Also we'll be getting our hands dirty by busting up some pallets, and trying out our pallet busting tool. If you're interested in participating or simply watching how it's done - feel free to come by... activities start around 6pm. YOUR best next career move?" You’re invited to join this informal discussion on the pros and cons of pausing to consider your post-secondary education options. our serger sewing machine up and running. The regular Singer sewing machine is now operational and ready to use. Learn a new skill and gift-making idea! Our first soap workshop filled up in less than 24 hours so we are offering another one; this one in time for EASTER! Join us Thursday, April 2nd from 6-8pm for a step-by-step class on how to make a variety of soap creations out of glycerin, goat's milk, olive oil and more (even coffee, tea and dried flowers)! Participants of this hands-on class will be provided all the materials they need and will take home their creations that night! Packaging is also included so your soap will even be gift-ready when you leave. This no-experience-necessary workshop is also child-friendly (6+ with parent supervision) so why not MAKE something different this Easter! Contact info@frederictonmakerspace.ca for more information or to sign up. Proceeds benefiting both Fredericton Makerspace and the Canadian Diabetes Association. NOTE: this workshop has been postponed due to low registration response. There are several ways to get your unique artwork 'out there' but few are as easy and flexible as opening your own Zazzle 'virtual' Store. And you don't even have to be an 'artist' or buy expensive software. If you're a creative thinker, a natural punster or just have a sense of humour why not invest a bit of creative time and energy to develop a new long-term income stream. Zazzle prints your image on the product when it's ordered. Zazzle packs and ships the product to the customer. Zazzle emails you to tell you how much your royalty is. Learn how you can earn referral fees when someone buys another sellers product and how you can promote your products on your favourite social media - Facebook, Pinterest, Twitter, etc. Bring a laptop if you have one so you can see how easy it is to set up your own Zazzle store. You'll want to take notes too. If you're interested in a future Soap Making Workshop email us at info@frederictonmakerspace.ca and get on the Early Bird list. Please include your name and number of tickets. Join us for a step-by-step class on how to make a variety of soap creations out of glycerin, goat's milk, olive oil and more (even coffee)! Participants of this hands-on class will be provided all the materials they need and will take home their creations that night! Packing is also included so your soap will even be gift-ready when you leave. This no-experience-necessary workshop is also child-friendly (6+ with parent supervision) so why not MAKE something different this St. Patrick's Day! Proceeds benefiting both Makerspace and the Canadian Diabetes Association. NOTE: This event will be hosted at 469 King Street! (not the Makerspace). Even though this is a Fredericton Makerspace event, it's being hosted in the Wear Your Label Design Studio (2nd Floor) on King Street. Thanks to our friends at Wear Your Label for the use of their space! Passive solar heating is gaining popularity as an inexpensive addition to traditional heating sources. The coldest winter days often come with clear skies and sunshine. Learn how to take best advantage of this free source of heat. This workshop will introduce you to the basic principals behind passive solar heating, and the various ways we can take advantage of the sun's warmth to reduce energy bills and mitigate the effects of climate change. We'll explore ways to reduce heat loss through energy efficient building design and touch on the differences between passive solar air heating, solar water heating and active photo voltaic solar panel systems. If it`s a sunny day, we`ll take the two small solar heaters we have in the makerspace outside and see how they perform. This introductory workshop will lay the ground work for a follow-up workshop when participants will build two types of solar air heaters and compare performance of the solar absorbers - pop cans vs window screen. The follow up workshop date will be determined by polling workshop participants who are interested in building prototype solar air heaters and comparing performance characteristics. You may want to bring a laptop if you have one, to bookmark reference sites from the discussion and share links with the group that you may have found on your own. Arduino is a great tool for making interactive objects, taking inputs from a variety of switches or sensors, and controlling a variety of lights, motors and other outputs. With an Arduino you can build almost anything, from a simple flashing light to a box of tricks that sends you a Twitter message when your houseplants get thirsty. Arduinos have been used to make everything from electronic dice to controlling ambient lighting. They’re also the brains in a lot of 3D printers! In the class we will go over some of the basics of electronics and electrical theory (analog vs digital, input vs output, bread boards, resistors, LEDs) to provide some background. We will also cover microcontrollers and some common simple applications before diving in and walking you through how to setup an arduino and build some simple projects together. You'll also get some inspiration by learning about what Makers in the Fredericton Makerspace are doing with Arduinos! and all the goodies you need to get started! You'll leave the workshop with your head filled with awesome project ideas you can do with an Arduino! *Note: You don't get to take an arduino home! :( There will be some arduinos in the Makerspace available for members to use. If you'd like to have your own arduino after the workspace we can help you find one! In this workshop you will be introduced to the basics of photoshop. Learn about the tools available to help you enhance and manipulate your images and discover how layers can help your workflow as you design your project. This session will give you the necessary skills to get you started with Photoshop on your own. At one time or another we have all wanted to resize a photo, create a logo for a brand, or perhaps you have a more significant design project that you wish to take on. As a leader in design software Photoshop has become a desirable skillset that can help you on the job or with personal projects. In this introductory workshop you’ll learn to use the tools in Photoshop and some design theory to accompany the lesson. In this workshop you will gain a holistic overview of Photoshop, including the tools panel, layers, and other important functions that will have you designing with confidence. You will learn about editing photos, creating personal designs, how to save documents and proper file formats. Participants can begin working on a business card design and the instructor can help you with selecting colours and fonts that represent your personal brand. For those who are interested, you'll also have some time to work on any of the projects you start during the workshop, or you can bring a personal project/photo and work through some of the problems that you are experiencing. This workshop has been designed for absolute beginners. If you know absolutely nothing about design or photoshop, you’re in the right place! NOTE: This event will be hosted at 469 King Street! (not the Makerspace)Event though this is a Fredericton Makerspace event, it's being hosted in the Wear Your Label Design Studio (2nd Floor) on King Street. Thanks to our friends at Wear Your Label for the use of their space! The class works for Makers of different experience levels. Beginner or intermediate - there's something to learn! Don't be shy. 1) A basic introduction to the Arduino family of microcontrollers. Even if you’ve never heard of a microcontroller before, we’re here to help! 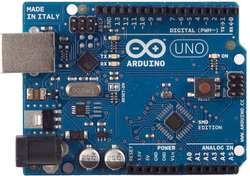 2) An intermediate course if you've played around with an Arduino before and want to learn more! Take your skills to the next level! You’ll leave the workshop with your head filled with awesome project ideas you can do with an Arduino! Note: You don’t get to take an arduino home! :( There will be some arduinos in the Makerspace available for members to use. If you’d like to have your own arduino after the workspace we can help you find one! Thursday, 24 July 2014. 6:00pm - 9:00pm @ 28 Saunders Street. This Thursday night we’ll be having an open house, BBQ and Tool Drive at the Fredericton Makerspace! We’ve been busy getting the space up and running! While we’re not ready to take the wraps off quite yet, we’d love to share who, what, and where we are with you. It will be a mix and mingle event so stop in and say hi! If you have some tools you’d like to donate or loan to the space - bring them along so we can start putting them to good use! We’re looking for everything from screwdrivers, wrenches and pliers to sewing machines, safety equipment and sandpaper to drills, soldering irons and stepper motors. If we can build something with it - we want it! THE FIRST EVENT IN OUR NEW MAKERSPACE! All ages, family-friendly. This is for anyone wanting to compost - especially handy for apartment dwellers and gardeners. 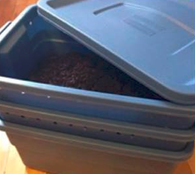 We'll be making worm compost systems out of plastic bins and doing an educational session on vermicomposting (with kid-friendly activites). You can bring your own bins or buy a kit. We have a special mix of composting worms available to all workshop attendees. At the BRAND NEW Fredericton Makerspace. This is the first public event in the space. We have a Saturday afternoon and Wednesday evening option. Same workshop. If you have a drill with a 1/4 inch bit, please bring it along for the day! Makers will be grouped into teams. Each team will build a variation of a small, single column pop can heater. The goal – to make the most efficient heater! We’ll have a few Arduinos on site to play with wired up to measure the air coming out of the heaters. We hope to have sun! If not, we’ll improvise. NOTE! We don’t expect there will be time to build an entire unit. We’ll be building and testing single column stacks. If you have any pop cans, bring them along. A single column build will take around 6-9 cans depending on the height. We’ll have some on site, but the more the merrier! There will be WiFi on site. If you need do research during the build, a laptop / tablet may be helpful. The event will be in an unheated garage. Make sure you dress for the weather on the day of the event! If you need a place to sit and take a break, bring a camp chair along too. Yes, we’ll BBQ on-site! We’ll have the basic essentials - Burgers & hotdogs! If you have other dietary needs, bring what you’d like to grill. A HUGE thanks to Jon O’Donnell for offering up his space to the event. Thanks, Jon! Thanks to everyone who made it to our launch event at Planet Hatch! Did you miss it? You can relive it by watching a re-cap here. A big thanks to Gracen Johnson for the videography and editing!